I gotta say, it’s pretty hard trying to put in words what a great feeling I felt last four days, camping in Yellowstone. How can you explain the sensation you feel while watching a pack of wolves from a distance, the Hayden Valley in front of you like a theater, and on screen a live National Geographic documentary?! Or when you just turn around and find a buffalo wandering behind you in the middle of the street like it’s completely normal. Or again when driving, while the sun is slowly coming up, your headlights light up a big elk eating grass along the roadside. All of this happening in the middle of the Rocky Mountains, among hundreds of waterfalls, rivers, meadows, creeks and then geysers, fumaroles and breathtaking views. Well, I guess I can’t. I’m just gonna let the images speak for me. Take it easy guys. And go to Yellowstone. 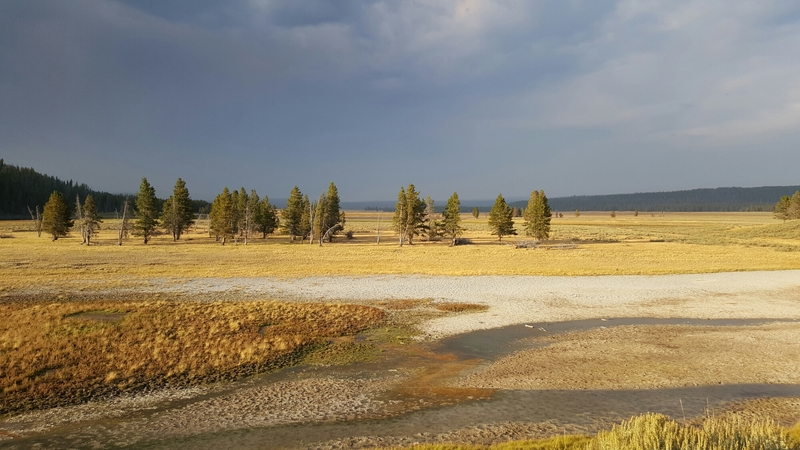 This entry was posted on Friday, August 19th, 2016 at 16:12	and tagged with nationalpark, ontheroad, roadtrip, travel, Travels, us, USA, viaggi, wildlife, wyoming, Yellowstone and posted in Live From The Field, vlog. You can follow any responses to this entry through the RSS 2.0 feed.